1. Put the rice and 500ml water into a pan. Bring to the boil, stir once, cover, then simmer for 10 minutes. Turn off the heat and leave the rice to steam for 10 minutes more. 2. Combine the soy sauce, sugar and fi sh sauce; set aside. When the rice is almost ready, heat half the oil a large frying pan or wok over a high heat. Add the chilli and garlic and fry for 1 minute. Add the prawns, fry for another minute, then add the peas and salad onions and cook for another couple of minutes, until the prawns are pink all over. 3. 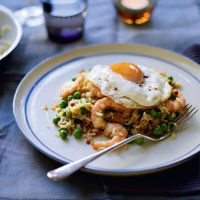 Toss the rice with the prawns and vegetables, then pour in the soy sauce mixture and stir-fry until evenly coated. Scoop into serving bowls. Wipe out the pan, return to a high heat and add the remaining oil. Fry the eggs for 3-4 minutes until the whites are set. Serve the fried eggs on top of the rice. This recipe was first published in Tue Jan 03 12:00:00 GMT 2012.